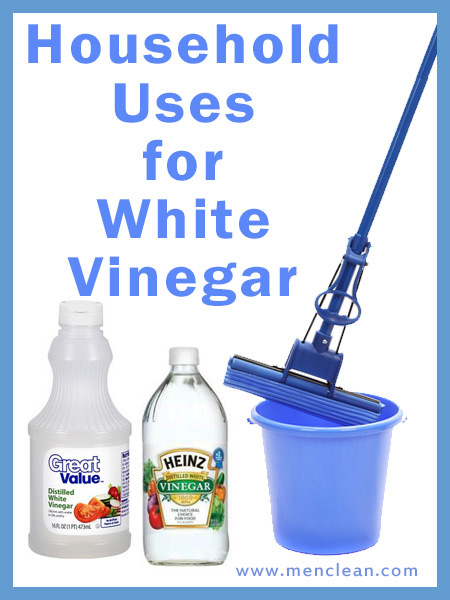 Good ol’ white vinegar is a strong antimicrobial agent and solvent that banishes bacteria, odors, and stains. It’s an extremely cheap—$2.50 a gallon—and nontoxic alternative to harsh cleaners. When combined with other ingredients you’re bound to have on-hand (e.g., water or salt), vinegar can clean anything in your house. Well, just about anything. But when it comes to other household tasks like disinfecting, deodorizing, and removing stains, vinegar has your back. Refresh your fridge: Wipe down shelves, bins, and walls with a 1-to-1 solution of vinegar and water. Remove coffee stains: Scrub coffee stains from mugs with a paste of equal parts vinegar and salt. The salt acts as a mild abrasive. Beat bathroom germs: Wipe down the outside of the toilet and around the sink and shower enclosure with full-strength vinegar. Follow up with a damp sponge. Clean toilet bowls: Pour a cup of vinegar into the bowl, let it work its magic for a few hours, scrub with a toilet brush, and flush.Voila! Clean crud from faucet aerators: Soak faucet aerators in vinegar for an hour. Scrub the screen with an old toothbrush and rinse. Shine shower doors: Remove soap residue on glass shower doors by scrubbing with a sponge soaked in full-strength vinegar. Deodorize the garbage disposal: Keep your garbage disposal odor-free with vinegar ice cubes. Mix a solution of 1 cup vinegar and 2 cups water, and freeze the solution in an ice-cube tray. Run several cubes through the disposal, then flush with cold water. Yes, this really works. Clean the coffee maker: Get rid of mineral deposits from your automatic drip coffee maker during spring cleaning by filling it with vinegar and running it through a brewing cycle (but leave out the coffee grounds!). Rinse the coffee maker thoroughly after the treatment. Disinfect cutting boards: Scrub cutting boards with full-strength vinegar. Rinse thoroughly. 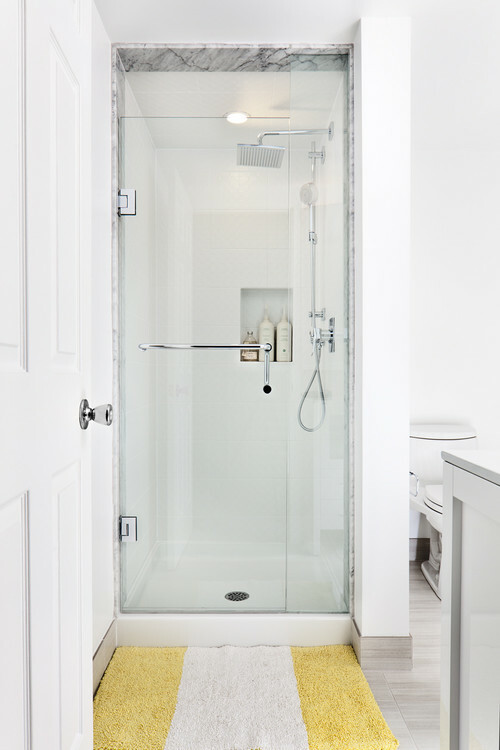 Photo by Rad Design Inc – Use vinegar to get those annoying water stains and soap residue off your shower door. Carpet cleaner: Remove carpet stains with a mixture of 1 teaspoon vinegar and 1 teaspoon liquid detergent. Squeeze onto the stain, blot (don’t rub), then rinse with a small amount of clean water. Brighten the wash: Make your whites whiter and your colors more vibrant by adding a half-cup of vinegar to your wash. Vinegar also helps reduce static cling. Shine shoes: Restore the luster and remove scuff marks from old leather shoes and handbags by wiping them with vinegar. Follow the treatment with a damp cloth and a fresh coat of polish. Revive cut flowers: Boost a tired bouquet by adding a tablespoon of vinegar and a pinch of sugar to half-quart of water. Pour the solution into the vase. Wash windows: Spray windows with a solution of equal parts warm water and vinegar; wipe dry with a microfiber cloth for streak-free glass. Remove water marks: Vinegar can remove rings on woodwork caused by wet glasses. Rub the mark with a solution of equal parts vinegar and olive oil. Rub with the grain, then wipe dry. Test an inconspicuous spot first. Renew clothes: Make clothes and towels soft again by adding a half-cup of vinegar to the last rinse cycle of a load of laundry. Polish metal: Make brass and copper shine with a paste made of 1 teaspoon salt dissolved in 1 cup vinegar. Add flour to make a soft paste. Apply the paste, let stand 15 minutes, then rinse and polish with a soft cloth. Remove labels: Get rid of sticky label residue by rubbing stubborn glue with vinegar. Clean glass fireplace doors: Remove soot from fireplace doors with a solution of equal parts vinegar and water. Wipe clean with a microfiber cloth. 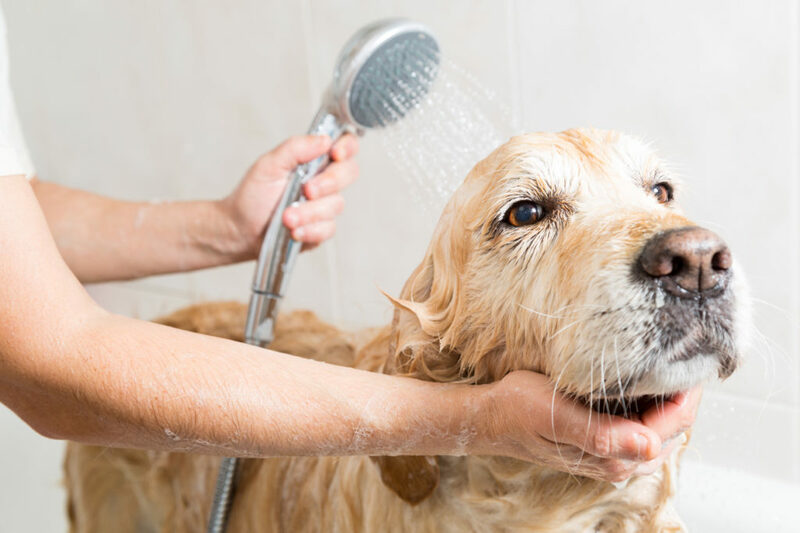 Deodorize doggy smell: Wet your pooch with plain water, then wash the dog with a solution of 1 cup vinegar diluted in 2 gallons water. Make sure to keep the solution out of the dog’s eyes. Dry the dog without rinsing. Fight dandruff: Give your hair a final rinse with a half-cup of vinegar mixed with 2 cups of warm water. Relieve itch: Add a quarter-cup of vinegar to your bath water to soothe itchy skin. Remove weeds: Straight vinegar will get rid of weeds in your yard and driveway cracks. Pour directly on unwanted plants, making sure to protect wanted plants. Soften old paintbrushes: Soak paintbrushes in warm vinegar, then wash the bristles with warm soapy water. Rinse thoroughly.